The San José Chamber Orchestra, a professional string-based ensemble of 19+ players, presents a series of 7–9 programs per season. Many performances feature one or more commissions or world premieres by award winning composers with critically acclaimed guest artists as featured soloists. San José Chamber Orchestra is the recipient of five ASCAP/League of American Orchestras Adventurous Programming Awards, has produced seven CDs of American music and commissioned and/or premiered over 170 new works in 26 seasons. The San José Chamber Orchestra was founded in 1991 out of the desire of local musicians (at the time playing with Opera San José) for an opportunity to play chamber orchestra repertoire and explore music written by living composers. Its formation was sparked by a challenge in the METRO newspaper from the late drummer Sammy Cohen to music director Barbara Day Turner, announcing that an orchestra was forming (unbeknownst to her) and privately saying to stop being lazy and get started. 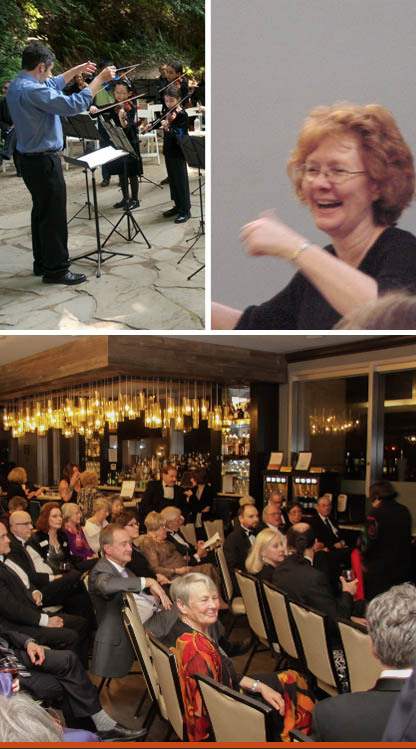 The San José Chamber Music Society graciously sponsored the first concert and a board was formed shortly thereafter. 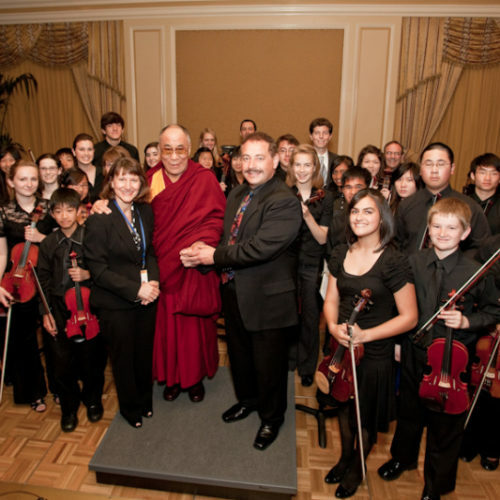 Appearance of our senior youth orchestra at a private event for the Dalai Lama. Prestigious Koussevitzky commissioning awards for new works by Hyo-Shin Na and Pablo Furman… Performing with William F. Buckley, Jr… Recording at Skywalker Ranch… More than a dozen years of creative programming with our partner CHORAL PROJECT in our annual Winter’s Gifts presentations… Six years of partnering with sjDANCEco at the California and Hammer Theatres in San José and at ODC Dance in San Francisco… Collaborations with the Klein International String Competition and the Merola Opera program… Presenting short theatre/music pieces, including the mini-opera Waterbird Talk and the dramatic work Psyche and Eros… Creating music with performers on both non-Western and classically non-traditional solo instruments, including the komungu, erhu, sitar, waterphone and accordion. 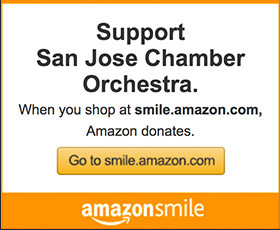 The mission of the San José Chamber Orchestra (SJCO) is to share exciting, thought-provoking, and vibrant music by contemporary and time-honored composers reflecting the cultural diversity of our ever-changing community, and to support and inspire the next generation of musicians and audiences. In addition, SJCO embraces the responsibility of providing young, emerging artists with opportunities to work with established musicians and composers in order to provide collaborative, creative environments that create connection to community and are key in the twenty-first century. We are passionate about sharing music by living composers and developing skills and the love of music in the next generation. Maestra Barbara Day Turner is the founder and music director of the San José Chamber Orchestra, and its family of youth orchestras. An ardent advocate for new music, she has premiered more than 140 new works just with SJCO. Named the 2012 Silicon Valley Arts Council “On Stage” Artist Laureate, Maestra Day Turner recently completed 15 seasons as Music Administrator and Conductor of the Utah Festival Opera and spent 18 years as Artistic Administrator and Conductor for Opera San José. She has conducted the world premiere of operas by Henry Mollicone, Craig Bohmler, George Roumanis and Alva Henderson and has over 100 operas and musicals in her repertoire. Abroad, Maestra Day Turner has conducted opera in Berlin and the Thuringian Symphony Orchestra in Germany as well as the Orquesta Sinfónica de Aguascalientes, Mexico. 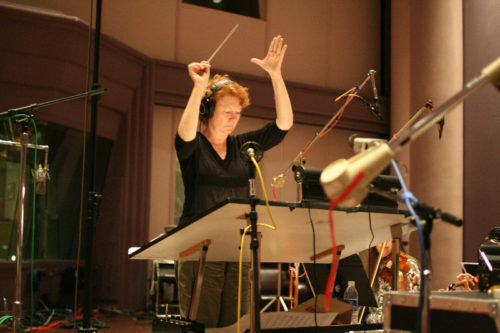 Maestra Turner’s discography includes 6 recordings with SJCO, the PBS award-winning DVD of George Roumanis’ opera Phaedra, the Naxos release of Alva Henderson’s opera Nosferatu, and a recent critically acclaimed Naxos release of varied works by Howard Hersh entitled Angels and Watermarks. She is a frequent adjudicator for the Metropolitan Opera national auditions, annually serves as a judge for the Irving M. Klein International String Competition, and serves on the board of directors of the Women’s Philharmonic Advocacy and the advisory boards of the Delphi Trio and Opera Neo in San Diego. The SJCO Youth Orchestra Program, begun in 2001, now encompasses seven orchestras serving approximately 130 young string and flute players and a new chamber ensemble program. This program is designed to equip young players with the skills needed for excellent performance, as well as instill disciplines useful in all areas of life and foster a wider appreciation of the arts. SJYCO distinguishes itself through the strong mentoring relationship that the professional orchestra provides, giving students opportunities to work directly with professionals who coach sectional rehearsals, and through the annual “Side-by-Side” concerts, where the senior orchestra performs side-by-side with the members of the professional orchestra and the younger groups perform side-by-side with the seniors. The Senior YCO also works with a composer on a newly commissioned work each season, annually appears on a regular SJCO subscription concert, and makes a summer trip to New York City once every few years.